U.S. Secretary of Agriculture Sonny Perdue announced the implementation status of the 2018 Farm Bill. President Trump signed this Farm Bill into law on December 20th, 2018 and the U.S. Department of Agriculture (USDA) promptly began implementation of key programs. USDA held several listening sessions with stakeholders and the public, specific to each agency’s respective mission areas. Dairy Forward Pricing Program: On March 1, 2019, the Agricultural Marketing Service (AMS) published a final rule reauthorizing the Dairy Forward Pricing Program in the Federal Register. Class I Skim Milk Price: On March 11, 2019, AMS published a final rule implementing the Class I Skim Milk Price provision in the Federal Register. Margin Protection Program for Dairy (MPP-Dairy): On March 22, 2019, Farm Service Agency (FSA) announced that dairy producers who elected to participate in the Livestock Gross Margin for Dairy Cattle Program in 2018 can now retroactively participate in the MPP-Dairy for 2018. Dairy Margin Coverage Program: On March 28, 2019, the National Agricultural Statistics Service (NASS) revised monthly price survey reports to include prices for high-quality alfalfa hay in the top five milk producing states to be utilized in the new Dairy Margin Coverage feed calculation. FSA will begin offering reimbursements to eligible producers for MPP-Dairy premiums paid between 2014-2017 by May 1. The Office of the Chief Economist has entered into an agreement with the University of Wisconsin to develop a Dairy Margin Coverage decision tool that will be available to producers by May 1. FSA will open sign-up for the new Dairy Margin Coverage Program beginning June 17, providing coverage retroactive to January 1, 2019, with applicable payments following soon after enrollment. Emergency Conservation Program (ECP): On April 4, 2019, FSA announced several changes to ECP as provided by the 2018 Farm Bill, including increasing the payment limit from $200,000 per person or legal entity per natural event to $500,000. On April 4, 2019, FSA announced that socially disadvantaged and beginning farmers or ranchers are now eligible for up to 90 percent ECP cost share of their total allowable cost. Noninsurance Crop Disaster Assistance Program (NAP): On April 8, 2019, FSA announced that producers now have a one-time opportunity until May 24, 2019, to obtain buy-up coverage for 2019 or 2020 eligible crops for which the NAP application closing date has passed. In addition, qualified military veteran farmers and ranchers are now eligible for a service fee waiver and premium reduction. Marketing Assistance Loans (MAL): On April 10, 2019, FSA announced the 2019 Marketing Assistance Loan rates for wheat, feed grains, oilseeds, rice and pulse crops. Relative to 2018-crop MAL levels, the 2018 Farm Bill increased the national loan rates for most of these commodities for each of the 2019-2023 crops. Agriculture Risk Coverage (ARC) and Price Loss Coverage (PLC) Programs: FSA will open ARC/PLC elections for the 2019 and 2020 crop years beginning in September 2019. Conservation Innovation Grants: On March 26, 2019, Natural Resources Conservation Service (NRCS) state offices began publishing notices of funding availability for the Conservation Innovation Grants state competitions. Agricultural Conservation Easement Program: On March 27, USDA published an announcement regarding the availability of $450 million for wetland and agricultural land easements that will help private landowners, tribes, land trusts and other groups wanting to restore and protect critical wetlands and protect agricultural lands and grasslands. Conservation Stewardship Program (CSP): On April 5, 2019, NRCS announced the next deadline for CSP applications to be raked and considered for funding this year is May 10, 2019. It includes higher payments for enhancements that include cover crops, resource conserving crop rotations, and advanced grazing. Regional Conservation Partnership Program (RCPP): On April 9, 2019, NRCS determined that RCPP projects with agreements entered into prior to September 30, 2018, may continue to enter into new RCPP-CSP contracts with eligible producers, which will be administered under the new CSP authority. Environmental Quality Incentives Program: This program operates through a continuous signup process. Applications may be submitted throughout the year. At the state level, NRCS has periodic funding cutoff periods when applications are evaluated for selection. Agricultural Trade Promotion and Facilitation Funding: On February 7, 2019, the Foreign Agriculture Service (FAS) allocated more than $204 million in Market Access Program and Foreign Market and Development Program. Food for Progress: On March 26, 2019, FAS announced $155 million funding opportunity for the Food for Progress program. McGovern-Dole School Feeding Program: On March 26, 2019, FAS announced $191 million in a funding opportunity for the McGovern-Dole School Feeding Program. Local and Regional Food Aid Procurement: On March 26, 2019, FAS announced up to $15 million funding opportunity for Local and Regional Food Aid Procurement. Cochran Fellowship Program 2019: On March 26, 2019, FAS announced the availability of $1.8 million for the Cochran Fellowship Program. Simplified Homeless Housing Costs: On February 8, 2019, the Food and Nutrition Service (FNS) issued an informational memorandum on Simplified Homeless Housing Costs. Supplemental Nutrition Assistance Program (SNAP) Employment and Training: On March 6, 2019, FNS issued an information memorandum on the Employment and Training provisions, including those that are self-executing. Supplemental Nutrition Assistance Program (SNAP): On March 7, 2019, FNS issued an information memorandum for the self-enacting provisions of the SNAP Provisions of the Agriculture Improvement Act of 2018. Commodity Supplemental Food Program (CSFP): On March 8, 2019, FNS issued the information memorandum for CSFP and the exception for temporary monthly certification periods. Food Distribution Program on Indian Reservations (FDPIR): On February 14, 2019, FNS held an in-person consultation with tribal leaders to discuss a variety of topics regarding FDPIR, including Farm Bill provisions. On April 5, 2019, FNS issued an informational memorandum to announce the availability of FDPIR administrative funding for two-years at the State/Indian Tribal Organization level. Modified Micro Loan Limits: On March 7, 2019, FSA implemented a change to allow agricultural producers to receive both a $50,000 Direct Operating Microloan and a $50,000 Direct Farm Ownership Microloan. Previously, agricultural producers were limited to a combined total of $50,000. Increase in Percent of Guarantee for Beginning and Socially Disadvantaged Farmers: On March 7, 2019, FSA increased the percent for new guaranteed loans to any beginning or socially disadvantaged agricultural producer to 95 percent. Increased Loan Limits: On April 11, 2019, FSA announced that eligible agricultural producers have access to higher loan amounts, to better provide them with the credit needed during this period of lower market prices and numerous natural disasters. Cushion of Credit Program: On December 21, 2018, Rural Development informed all the Rural Utilities Service (RUS) borrowers of the new provisions in the 2018 Farm Bill affecting the borrower’s participation in the Cushion of Credit Program. American Broadband Initiative: On February 13, 2019, Rural Development released the American Broadband Initiatives Milestones report, describing how the Federal government is partnering with the private sector expand rural broadband. Community Facilities Technical Assistance and Training Program: On April 1, 2019, the Rural Housing Service began soliciting applications for the Community Facilities Technical Assistance and Training Programs. Council on Rural Community Innovation and Economic Development: The Council is the successor to the Interagency Task Force on Agriculture and Rural Prosperity. The Council held its first call on April 8, 2019, to coordinate rural community innovation and economic development across the federal government. Rural Water and Waste Water Technical Assistance and Training Programs: On April 1, 2019, the Rural Utilities Service published a Notice of Solicitation of Applications in the Federal Register. Matching Fund Requirements: On March 20, 2019, National Institute of Food and Agriculture (NIFA) published the updated matching requirements chart on its website, sent an update to all stakeholders via the weekly NIFA Stakeholder Update. Relevant future RFA’s will include updated matching requirements. Indirect Cost Limitations: On March 20, 2019, NIFA published the updated indirect cost rate requirements by program chart on its website. Relevant future Requests for Applications (RFA’s) will include updated indirect cost rate requirements. The Beginning Farmer and Rancher Development Program (BFRDP): On April 5, 2019, NIFA published the Request for Applications (RFA) for BFRDP. Barley Estimation Program: On March 7, 2019, the National Agricultural Statistics Service (NASS) established that New York will be added to the Barley estimation program. Nominations of Members: On March 28, 2019, the Request for Nominations of Members for the National Agricultural Research, Extension, Education, and Economics Advisory Board, Specialty Crop Committee, Citrus Disease Subcommittee, and National Genetic Resources Advisory Council published in the Federal Register. Healthy Forests Restoration Act of 2003 Amendments – On March 14, 2019, the Forest Service announced the changes and the extension to 2023 of these provisions. Stakeholder Engagement: On March 22, 2019, Under Secretary Hubbard and Forest Service Chief Vicki Christiansen held a public listening session to receive stakeholder input on 2018 Farm Bill provisions regarding national forests and grassland. Biorefinery, Renewable Chemical, and Biobased Product Manufacturing Assistance Program: On April 1, 2019, the Rural Business and Cooperative Service posted an Administrative Notice to the Rural Development web site implementing the Farm Bill provisions for Section 9003 administratively. The Administrative Notice applies to all existing active 9003 program applications. Hemp: On February 27, 2019, AMS issued a Notice to Trade regarding the hemp provisions in the Farm Bill and on March 13, 2019, AMS held a listening session on the hemp provisions in the Farm Bill. The 2018 Farm Bill extended the 2014 Farm Bill provisions for hemp production by 12 months to allow USDA to complete the required rulemaking process, and USDA intends to issue regulations in the Fall of 2019 in order to accommodate the 2020 planting season. For the 2019 planting season, the 2018 Farm Bill provides that States, Tribes, and institutions of higher education can continue operating under authorities of the 2014 Farm Bill. Specialty Crop Block Grant Program: On March 7, 2019, AMS announced the availability of approximately $70 million for the Specialty Crop Block Grant Program. National Organic Standards Board (NOSB): In March 2019, AMS issued a Call for Nominations for the NOSB that included 2018 Farm Bill provisions that will lead to a more diverse candidate pool for the NOSB. Specialty Crop Insurance: On March 6, 2019, Risk Management Agency (RMA) created a dedicated Specialty Crop website to fulfill the requirements of the 2018 Farm Bill. The website lists specialty crop liaisons by Regional Office and provides a link to the 2019 Specialty Crop Report as well as a link to archived prior reports. 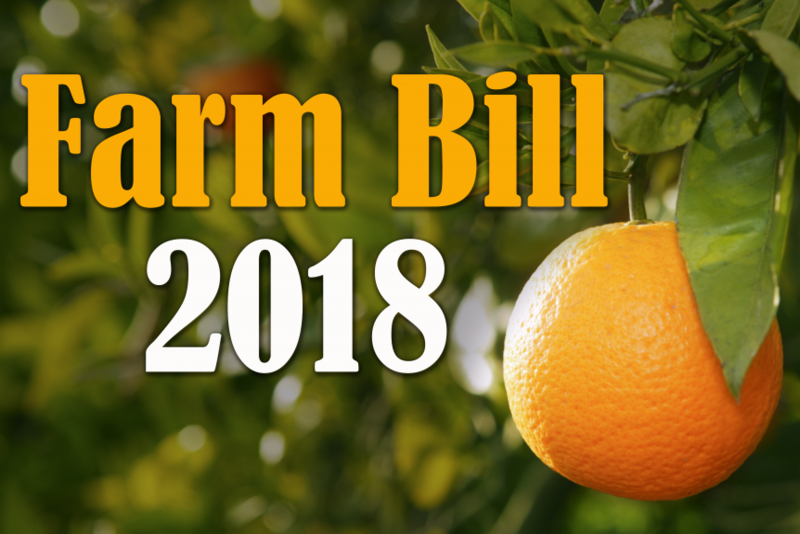 Beginning Farmer and Rancher: On March 12, 2019, RMA implemented the new definition for the Whole Farm Revenue Protection program that extends the time for new beginning farmer and rancher eligibility from 5 years to 10 years for the sales closing dates after the passage of the farm bill. Multi-County Enterprise Units: Starting with sales closing dates after the passage of the farm bill RMA is offering a new endorsement for farmers. Producers of corn, grain sorghum, soybeans, cotton, canola, peanuts, rice, barley, wheat, and sunflowers now have the option to combine acreage in one county that does not qualify for enterprise units with crop acreage in another county that does qualify. The option offers flexibility and a low-cost option for producers. Yield Cups: RMA has fully implemented yield cups that provide producers with an election to limit the decrease in actual production history (APH) to not more than 10% of the prior crop year’s APH. This prevents abnormally low yielding years from dramatically impacting a producers APH and stabilizes insurance guarantees. Agriculture and Food Defense: The Office of Homeland Security has commenced a series of events to educate the Intelligence Community on threats to agriculture and the collection of information on emerging threats. United States Drought Monitor (USDM): The Office of the Chief Economist has initiated a thorough review of the data being used in the USDM, the geographic coverage of data collection sites, and other climatological data that will improve the USDM. Agriculture Wool Apparel Manufactures Trust Fund: The Wool Apparel Manufacturing Trust Fund application period closed March 1, 2019. FAS reviewed 38 affidavits and is on course to issue payments by the statutory deadline. Pima Agriculture Cotton Trust Fund: The Pima Agriculture Cotton Trust Fund application period closed March 15, 2019. FAS reviewed 8 affidavits and is on course to issue payments by the statutory deadline. U.S. Grain Standards: On March 5, 2019, AMS posted a Notice to Trade announcing the restoration of certain exceptions under the U.S. Grain Standards Act. Acer Access and Development Program: On March 12, 2019, AMS announced the availability of funding under the Acer Access and Development Program. Peanut Standards Board: On March 19, 2019, AMS published in the Federal Register a notice requesting nominations to the Peanut Standards Board. The notice adds South Carolina as a part of the Virginia/Carolina peanut producing region for purposes of appointments to the board.